It’s no surprise that the number of visitors to Scottish Distilleries is higher than ever. This certainly matches our experience, every distillery we design has the visitor experience as its starting point. So many aging visitor centres are being rebuilt as fully immersive brand experiences. The experience must now match the branding, from building to bottle. Although gift shops may not be around for much longer, but that’s something we’ll come back to. Remember when nearly all malts went into blends? That was a time when the individual distilleries were just a curiosity, they didn’t matter as individual components, they were just ingredients. The character of one distillery would have been indistinguishable from another, just another set of whitewashed buildings, out of the way, weird quiet industrial sites under mountains or on beaches with tall chimneys and big lumpy warehouses. As single malts have started to eat into the market for blends they have to emphasise their individual character by celebrating their location. This started in pretty generic fashion - a misty eyed nostalgia of golden barley fields at sunset, the drink to be consumed when sat in a comfy chair overlooking pristine hills. Think Glenmorangie. But now the places are celebrated in detail just like their products. The search for a distinctive character is ever more hyper-local; think Bruachladdich and their barley which can be traced back to the very field it grew in. These buildings are more than just pretty places, they are integral to the character of the product. 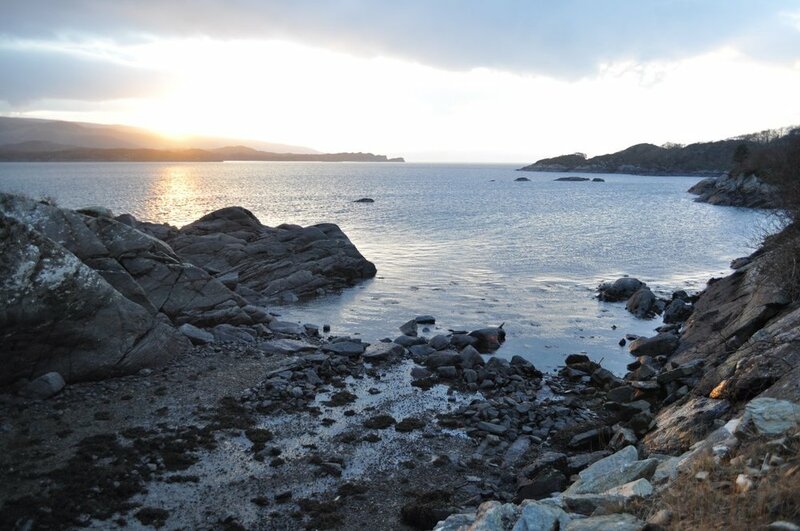 Whisky genuinely does rely upon the air and the water of an area for a big chunk of its character. You can taste the sea in Talisker and Bowmore. You can feel the clear cold of Speyside in a Glenfarclas. This character isn’t marketing hype, it’s real and it can be seen in every distillery visit. Traditional warehouses genuinely do have earthen floors to encourage a damp environment, allowing the casks to transpire. The barrels are not just breathing out alcohol, but breathing the local air back in. A cask stored in a different warehouse just wouldn’t taste the same. Whisky is distilled localism, the place makes the product. The advantage for the craft distillery newcomers is that they can commit to making a truly local product, and very often in a more idiosyncratic place. Small production volumes are more likely to be warehoused on site rather than in some distant industrial estate. Some distilleries take the care to source local yeasts rather than generic bagged high yield yeasts. Water can be from the local burn rather than municipal tap water. All of this is laid bare to the canny visitor with an eye for detail. So new and old distilleries must go out of their way to emphasise their difference, and to glory in it, and to demonstrate it to a very well educated public. The place where we as designers have integrated history and character to the maximum is Lindores Abbey Distillery. The story of the abbey is often quoted; malt was bought there to make spirit in 1494 and recorded in the exchequer rolls. It is famously the first record of Scottish distilling. What is remarkable is that the entire whisky industry accepts and supports this claim, a sign I think of the cohesive and friendly nature of a successful industry. After decades of hard work the Mackenzie Smiths completed their new distillery beside the ruins of the abbey. The distillery just took a 500 year break from production, but it is back up and running now. Branding a new spirit could be an exercise in fabrication, inventing history where there is none. But at Lindores there is so much history to draw on that there is no room for embroidering the truth. We put together the visitor centre with Paula Murray of Bright 3d who used the wealth of history in the design of the exhibition. Stones which came out of the ground during the excavation for new foundations were built into the walls. The original building had odd openings which were built up over time. These were retained for the tour route. Old character is priceless. 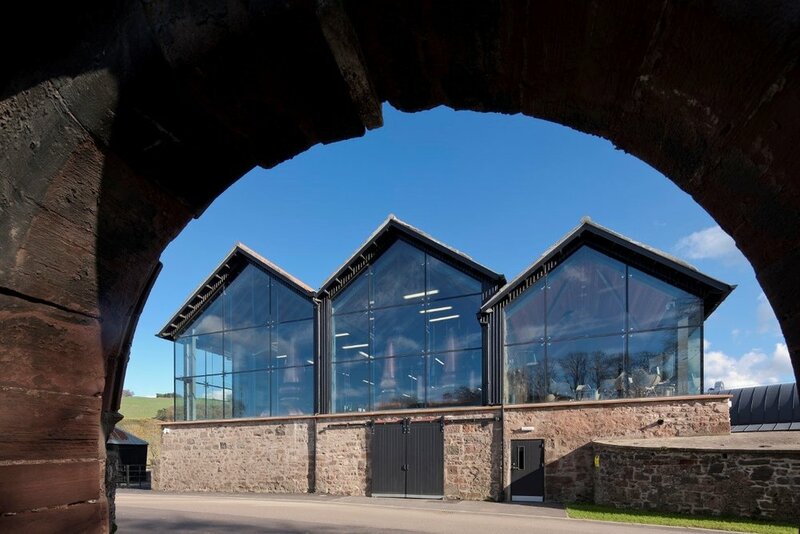 The existing farm building which was refurbished to form the distillery was built on a curious angle. This was obviously part of the original geometry of the abbey but the excavation gave a chance to expose foundations and understand the original layout. The results of the excavation will be recorded in Edinburgh. 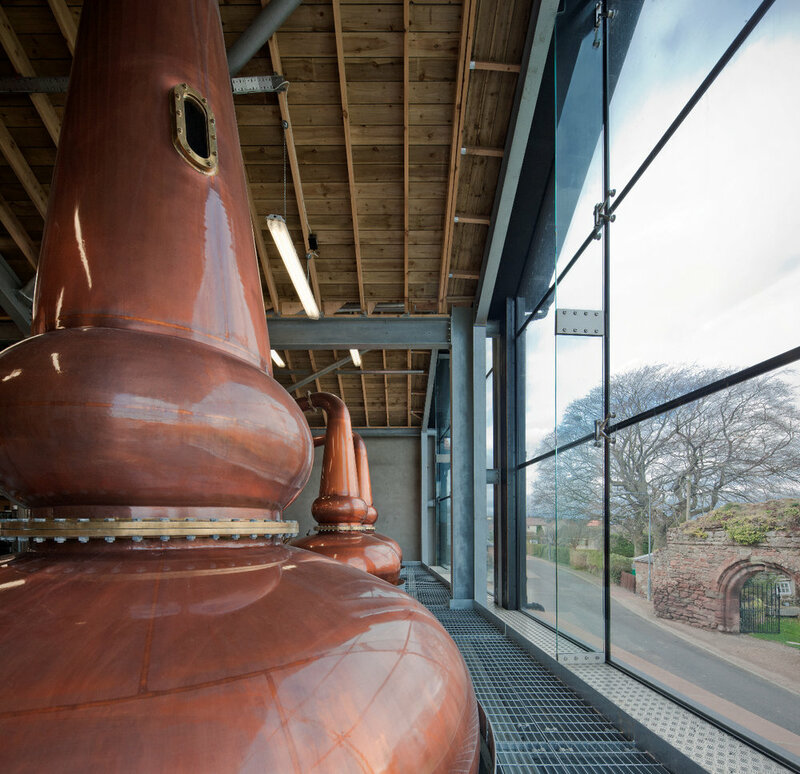 We placed new copper pot stills to overlook the abbey ruins, linking the old with the new. Large glazing gives a clear view inside and out. Perhaps this is how the monks would have built that place if they had today’s technology. Visitor numbers to the abbey ruins have increased remarkably. To their credit Historic Scotland permitted the new building because they understood that the appreciation of the abbey would increase. Now more visitors than ever can hear tales of William Wallace, Kings and Princes, John Knox and the reformation, and the untimely end of an entrepreneurial abbey who supplied food and drink to the Crown. At Lindores the entire building is a set of varied entertainment spaces. The entrance way has been used for presentations. The still room has a floor which can be set up for events. The long exhibition hall has an oak exhibition table which transforms into a dining space. An apothecary is used to mix and create spirit recipes. The first product which Lindores Abbey Distillery has produced is an Aqua Vitae. It is truly a product which has grown up out of the history of the place, an interpretation of the original spirit which was produced at the same place so long ago. The bottle is beautiful, it is a genuine product for visitors, unique to the place. So visitors to distilleries are looking for genuine and local experiences and products. Everybody does this when we travel, but there are few products so romantic and stiring to the visitor as whisky. This might be because of the sensory joy of walking into a maturation warehouse and smelling the angels share. It could be the experience of time-honoured production processes which have barely changed for two or three centuries. Or it might be the awesome attraction of large copper stills which even when they are silent function as hand made sculptures, beaten into anthropomorphic shapes by artisans from a beautiful natural material. Visitors are a key source of income for any distillery, but to the new distiller they are more than a bonus, they are a lifeline in a time of cashflow crisis. Consider the poor new distiller who has invested millions in their stills, boilers, buildings and warehouses. Just wait five, eight, ten years before you can make any sales! It’s a serious business, income is desperately needed. Hence the rise and rise of non matured spirits; gin, new make spirit, rum etc. The visitor centre is often the greatest employer, outnumbering the production staff by 4 or 5 to 1. In remote areas these jobs are gold dust, returning money to the local community and making small villages into thriving places. Distillery jobs are typically well paid too, diverting money into remote areas. Scottish (and increasingly English and Welsh) distilleries have a long way to go before they attract one million visitors every year as Kavalan Distillery does in Taiwan. In a way though this is an unfair comparison. King Car was a highly successful coffee brand which opened a whisky distillery. It’s a bit like Starbucks opening a bourbon distillery. Kavalan had a good head start. We once asked a far eastern distillery builder how 1 million visitors a year are accommodated. They actually wanted lots of spaces which could accommodate 50 people – one coach load per space. What a tour. Taiwanese distillery visitors are interested in single malt whisky because it is hand made, small batch and highly varied. Theirs is a society which has created a worldwide reputation in high quality mass production. Whisky characterises all the things that they have developed away from in other walks of life so it is a fascination to them. What is true in Taiwan is also true in mainland China. Single malt whisky has a great future in these parts of the world. It is the warm Taiwanese environment which causes whisky to mature so quickly. The angels are ferocious there – over 20% evaporative losses per year - because of heat and humidity. This means significant evaporation yet fantastic quick influence from the wood. I haven’t been there yet, but I expect that a visit to the warehouses at Kavalan is quite a heady experience. Some Scottish distilleries are now tentatively experimenting with heating warehouses. The jury is out on how authentic this is, but any method of speeding up maturation is another cash flow support to the fragile new producer. Let’s hope that visitors get to experience these warehouses on a Scottish tour. As global tourism increases we can expect ever increasing numbers of visitors to our distilleries. So distilleries must continue to develop our experiences to make the most of an increasingly knowledgeable audience. I cringe when I go on a tour with connoisseurs from, say, Scandinavia who have probably been on a hundred tours, yet the guide still shows them the very basics. The successful tour of the future will go into great clear detail. It will explain detailed matters of mashing, the benefits of long fermentation times, the 400 flavours imparted by copper, matters of wood chemistry in detail. Expect more analysis and interpretation of the maturation process by distillers in an effort to chase marginal gains. If 60 to 70% of the flavour of whisky comes from the cask this is where the search for quality lies. Small percentage improvements in quality and output are increasingly important as production continues to rise. New yeasts and new casks will be fascinating to our very knowledgeable consumers. Shops will become de-centralised with contactless technology: Make a purchase at any point in a distillery - in the still room, the warehouse or the cafe and pick it up on the way out. The very experience of spending and collecting is evolving so the building must evolve also. Distillery buildings will become ever more open and easier to understand. Whenever I can I ask to go ‘below the floor’ on a visit, that is to see below the steel midfloor down where the washbacks are supported on brick plinths, where original coal boilers may have been (still visible in still rooms such as Glen Grant) where heat exchangers are now making the process ever more energy efficient and where traditional spirit stores are still dipped by the excise man. Distillery tours of the future will make more of this level of detail, which gives greater insight into our favourite drink.